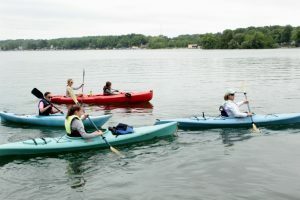 On Saturday, June 2, a group of 30 CLCF adventurers toured Gilbert Lake and the Indian Springs by kayak. 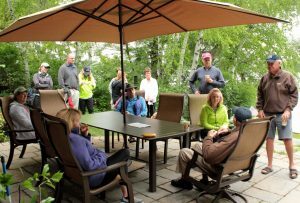 This event was organized by the Community Relations Committee, and Sue Meinerz hosted the launch from her Big Cedar Lake home. Doc Olsen, who owns the property where the springs are located, gave an informational briefing on the natural history of the area to each group. Kayaks left in small groups of four to six. 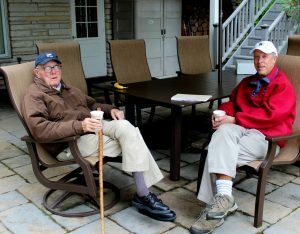 Bruce Reynolds met each group at the Springs to answer questions and talk about the hydrology of the site. The groundwater flowing to Gilbert Lake represents a significant portion of the lake’s water supply and provides a clean source of water that helps contribute to the health of Big Cedar Lake, Little Cedar Lake and Cedar Creek. The maintenance of this groundwater flow is crucial to the watershed. Cedar Lakes Conservation Foundation and the Wisconsin DNR provide protection to approximately 4,000 feet of uninterrupted shoreline on Gilbert Lake. Tamarack trees, water lilies, wild iris, skunk cabbage, and other plants provide habitat for a host of species on the lake. This is truly a natural jewel to admire from the water. Many thanks to the guides and hosts of this exciting event!